Aerial photo of a packed Seals Stadium. 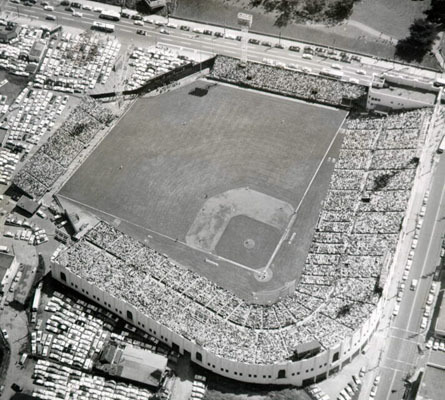 1931--Seals Stadium built at 16th and Bryant. During pioneer days this plot of land had been a land claim called "Home Plate Mine." The site is chosen because of its location in the "warm belt" which is free of fog during the summer. It was considered the finest baseball park in America when finished. The first game was an exhibition contest between the Seals and the Detroit Tigers on March 13. But the Great Depression was beginning to make it difficult for fans to attend, necessitating cutbacks to maintenance and upkeep of the park. 1932--Joe Dimaggio plays the last three games of the season as a replacement at shortstop. 1933--Joe Dimaggio's first full season. Hits in 61 consecutive games, finishing the season with 169 RBI and a batting average of .340. 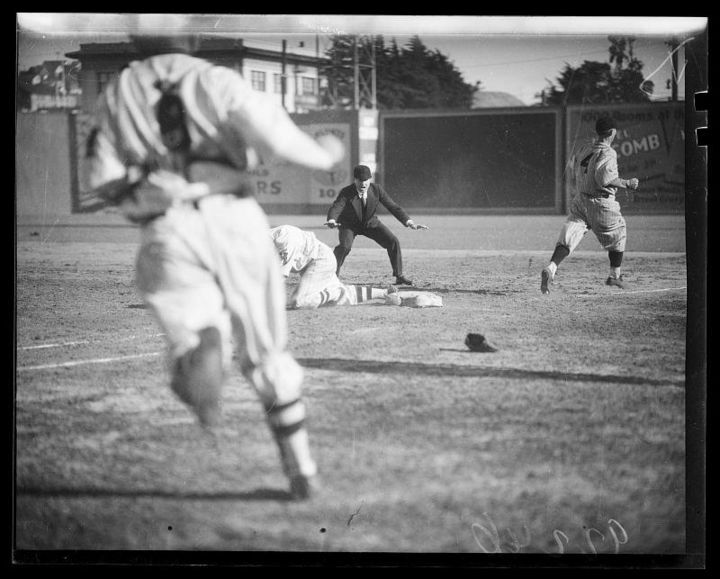 Opening Day of baseball, San Francisco Seals vs. Seattle, April 3, 1934. 1935--Under new manager Lefty O'Doul, one of the most popular figures in San Francisco baseball, the Seals win the pennant. Joe Dimaggio is sold to the Yankees, but is not required to report until 1936. He wins the PCL batting crown, hitting .398. 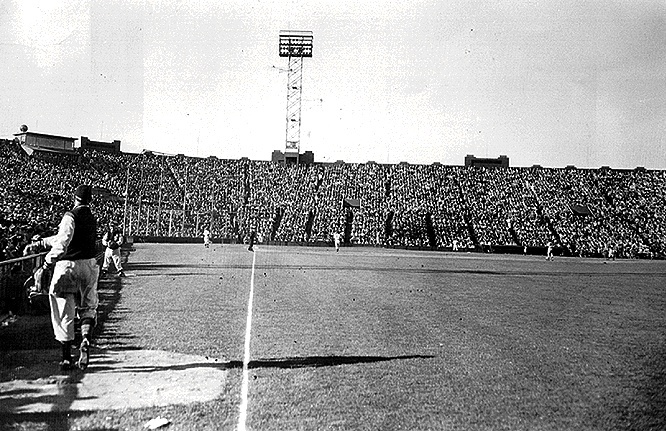 This Seals game in 1943 was played in front of a very sparse crowd. 1940s--Wartime baseball. Roosevelt had encouraged the playing of night games during the war so that working people would have a chance to attend games. But it was felt that ballpark lights created an attractive enemy target. Many players worked during the day, then played ball at night. As a patriotic gesture, the Seals uniforms during the war sported red and blue lettering with a "V" on the sleeve. By 1943 there was a scarcity of materials creating a brief "dead ball' era. Seals homers dropped from 53 in 1942 to 14 in 1944. In 1944 the Seals won the League Championship, now called the "Governor's Cup."